This is theEMD SD40-2 Mid Production Santa Fe #5088diesel locomotive from Kato. In early 1988, Santa Fe began relocating the headlights on its power from above the cab windows to the nose in an attempt to reduce glare reflected into the cab during foggy or blizzard conditions. 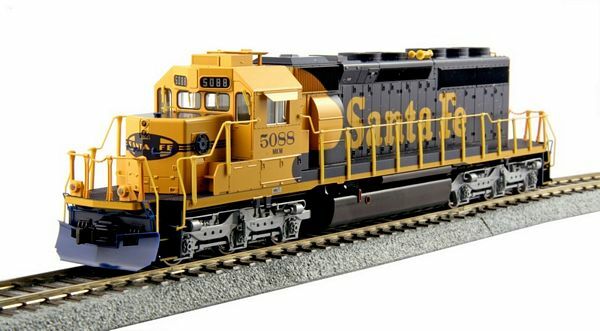 This made the Mid Production Santa Fe SD40-2s (and their descendants in the BNSF) different in form to their cousins. Over the years, other changes were made, including the migration of the airhorn further away from the cab and the installation of air conditioners to make the operation of their SD40-2s a more pleasant experience for the crew.